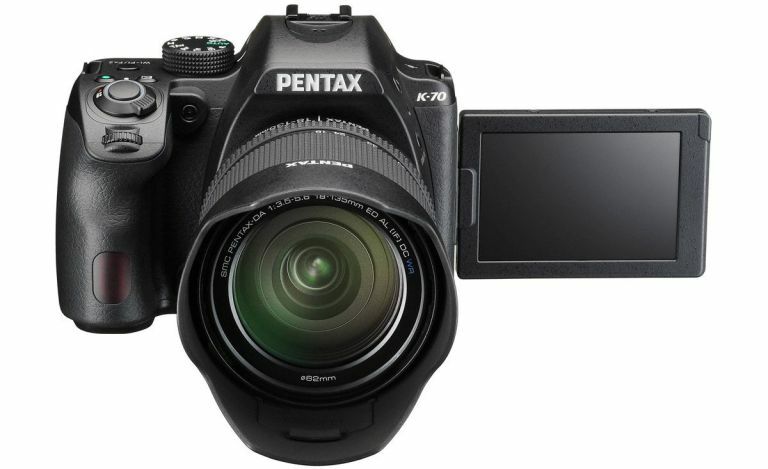 Richoh Imaging has just unveiled the latest addition to its roster of DSLRs - the all-weather Pentax K-70. This sturdy bit of equipment has been built to shoot in even the most wild of environments while still offering plenty of smart features on top. Much like its predecessors, the K-70 is one tough cookie - its dependable cold-proof performance shell can withstand temperatures as low as -10°C and its dust-proof so you can head out to far drier locations and still shoot without the fear your pricey bit of kit is going to choke out while you're taking shots. It's external LCD monitor is also made of sterner stuff so you can still track your shots or footage, whatever the weather. The K-70 is also compatible with a line of weather-resistant lenses, uses that all-important phase detection autofocus and that display we mentioned? It's a 3-incher, 921-dot display. All in all, it's exactly what you'd expect from the Pentax range, only retuned and calibrated in small doses. The big selling point here is the K-70's new smart features - how about some Wi-Fi connectivity? A first for the range, the K-70 boasts a fancy built-in wireless LAN (Wi-Fi) module for remote shooting operation and easy transfer of captured images to smartphones and tablets. Being able to transfer over your newly captured shots without the need for cables is a real game changer for those photographers who want to maximise their time out in the wild. The K-70 is only £559.99 (or £799.99 with the 18-135mm lens £799.99). Ricoh is planning to announce the official release date at the beginning of next month.